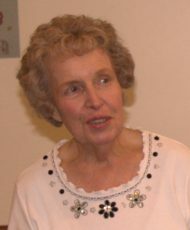 Mary Elizabeth Sinclair, 82, passed peacefully from a stroke on Wednesday, February 6th, 2019. “Liz” as she was known, was born June 8, 1936 in Baltimore, MD, to the late E. Carter and Dorothy (Neater) Perkins of Kimble Rd. She had been in decline from Alzheimer’s. Liz was preceded in death by her parents, second husband, Joseph E. Sinclair of Drumore, and first husband, Melvin L. Agne, of Baltimore, as well as her sister Aliceann Etheridge of Lutherville, MD. Liz was the daughter of an artist, and became a Baltimore City public school teacher until her retirement after three decades of service. She enjoyed boating, socializing, reading, traveling, needlepoint, gardening, and her grandchildren. She is survived by her son, Mel L. Agne of Delta, his wife Susan M. and grandchildren Matthias T., and Graham P. Agne, and nieces and nephews. She is also survived by children, grandchildren and great-grandchildren from the Sinclair family. A memorial service is planned at Bethesda Methodist Church, 1086 Hilldale Rd., Holtwood, Pa 17532 on Sunday, February 10 at 1PM. I loved her very much and will miss her greatly. To the woman who gave me life, uplifted me through all of it, taught me, tolerated me, and above all, loved me, you were my mother. I know you are with dad, and with all those who loved you who have gone before to that special place that ultimately awaits us all, and I know you are at peace. Thank you for the joys you gave us, the times you saved us, and the sacrifices that you made to make so many others happy. You did the best you could with what you had, and never asked for anything. It is my prayer that your cup runs over as the gifts you now recieve from our creator exceed your dreams as you hear the words “Well done, humble and faithful servant, with whom I am pleased.” I could not have asked for better, could not have been more loved, or welcomed into this world any better than by you Mom. You will be revered forever. Liz brought love, life and laughter to our father Joe. She loved life and her two families. I will miss my sweet Auntie Liz. She had an amazing spirit and such a kind soul.